Is God a magic man in the sky? Dr. Reagan: Tell us, what does the title of your newest book, The Magic Man in the Sky, mean? Where in the world did that come from? Carl Gallups: You're not the first person to ask me that question. The title was meant to be thought provoking, provocative even, if you will. The Skeptics and Atheists, they know exactly what the title means, because it is an argument they often use. Also, a lot of Christians know what the title means because they have heard it used against them. Dr. Reagan: So, Atheists just use this title flippantly when they reference God? Carl Gallups: Yes, and their argument basically goes like this: "Why should I believe in some magic man in the sky like you do, when I can believe in settled scientific fact?" Or, stated another way, "I would rather believe in settled scientific fact than some magic man in the sky." I've spent a lot of time in Internet ministry and I've spent years debating Skeptics, and Atheists, and Agnostics. This argument kept coming up again and again with them. Finally, I realized I needed to address that somehow in a world reaching venue. And so, the Lord put this idea of a book on my heart, but my book deals with a whole lot more than just this argument. Dr. Reagan: But, you don't like that title, do you? 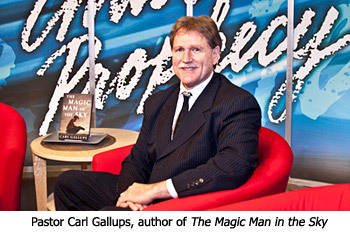 Carl Gallups: I don't like the title, no, because the words "the magic man in the sky" as a whole argument is a misnomer. It is a biblical misunderstanding. Neither the Bible nor the Christian declares that God is magic or that He uses magic. Neither the Bible nor the Christian who knows the Bible in context would declare that God is merely a man. We know that God put on flesh through His Son Jesus Christ and presented Himself as a man, as "God with us." We understand that concept. But, God is not just a bigger form of a man floating around out there in space somewhere. He's also not performing magic, And, certainly, He doesn't live in the sky. When a Skeptic uses it, or an Atheist uses it, or an Agnostic, they are conjuring up this image, but this is a straw man argument. They are conjuring up this image of some grandfatherly looking fellow in a rocking chair with a magic wand floating around in the clouds. Once you develop that caricature in someone's mind, especially a Christian who is not expecting that attack, it can debilitate a Christian. Listen to the two straw men. First, "I'd rather believe in settled scientific fact..." Well, that's an oxymoron. I don't know if there's anything settled in Science. Second, "...than a magic man in the sky." That's another complete misnomer. So, no, I don't like the title. I like the title as a book, and God has used it, but the argument it refutes is completely unbiblical. Nathan Jones: Ministry seems to attract former policemen. I hear you were a policeman, and that made me interested in your background and how you got into ministry from the police. Especially Internet ministry interests me as Web Minister, so I'd like to hear a little about what you do in that area. Carl Gallups: I started young as Florida's first 18 year old correctional officer with the Florida Department of Corrections, which is the state prison system. Two years later, at the age of 20, I was Jefferson County, Florida's first 20 year old deputy sheriff. This was back in the days when years ago everything used to be measured as an adult from 21 and over. But, they had just changed the law about the time I turned 18. Nathan Jones: So, you could arrest people, but you couldn't drink. Carl Gallups: Well, that's right! You could go to war, but you couldn't drink, yes. So, they'd changed the law and I was just turning 18 at the time, and I was very much fascinated by the law enforcement field as a career. Anyway, I applied, (it's a long story), and I became Florida's first 18 year old correctional officer then Jefferson's County first 20 year old deputy sheriff and sworn-in patrol officer. I worked for them for several years, and then I worked for Leon County, which is the capital of Florida. I ending up spending 10 years in law enforcement, with six or seven years as a sworn criminal patrol officer, and then a few years doing some of my own criminal investigations. Nathan Jones: But, your heart was in ministry during all of that time? Carl Gallups: Not all of that time, no. Sure, I was a Christian. I was saved at the age of 16, so I was a Christian during that time and I later married. In my late 20's, God really began to impress upon my heart a call to full-time ministry. Now, I've got to tell you, I'm a little bit ashamed of this part of my testimony. Do you know that it is entirely possible to be in love with the Lord, be doing the work of the Lord like I was serving in church and teaching Sunday school, and yet still be running from the Lord? I think of a man named Jonah. In other words, I was happy in law enforcement, and I was doing well as I was advancing in my career. My college education was in criminal justice. I graduated from Florida State in Criminology. Everything was geared towards that, but then God messed up my life, tongue-in-cheek, by interfering with my happiness and calling me into full-time ministry. The bottom line is that I ran from that calling for a couple of years. I'm ashamed of that now because God has so blessed my ministry and my life. I finally though surrendered fully to God's calling on my life and then began my journey with the Lord in full-time ministry. As I went through all of that transition, people always asked me, "How did you go from being a cop to a preacher?" The story is kind of complex. I didn't just get up one day and say, "You know what? I'm tired of being a cop. I think I want to be a preacher." No, no, no! I loved being in law enforcement. I did not want to be a preacher. Nathan Jones: We've had Don McGee and Jeff Seif on "Christ in Prophecy," and they were also policemen who went into ministry. Carl Gallups: So, they have similar testimonies? Nathan Jones: Similar, yes. They also ran from the Lord for a bit, but they finally took to full-time ministry. So, you are involved in Internet ministry on top of pastoring? You are on the radio as well? Carl Gallups: My ministry is multifaceted. First and foremost, I am the Senior Pastor at Hickory Hammock Baptist Church, a Baptist church in northwest Florida. I've been there 26 or 27 years now. Out of that has grown a very large radio ministry. I broadcast several programs that deal with current issues from a biblical viewpoint. I've got several programs. One is strictly biblical called "Ask the Preacher." But, another one that I have is called "Freedom Friday with Carl Gallups." Dr. Reagan: Are any of those programs available on the Internet? Carl Gallups: Yes, they are. They can all be accessed by going to carlgallups.com. Just go to the top right-hand corner where it says "Listen Live" and there you'll find all the information about me and my ministry and where you can listen to radio and podcast programs. In the second segment of our interview with Pastor Carl Gallups concerning the existence of God, he'll explain the differences between a secular, biblical and religious worldviews.